I will be your solid ground. It’s funny, but I knew my daughter would serve in the military before she did. After four years of watching her compete in high school JROTC competitions, I honestly couldn’t picture her in a dorm room studying economics. 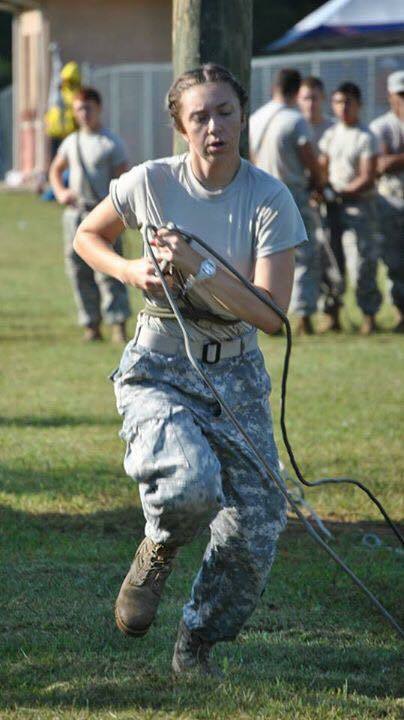 But she insisted throughout her senior year that she was done with camouflage, early morning workouts, inspections and obstacle courses. I listened to her reasoning and I offered a few of my own thoughts but ultimately, I knew she would have to decide the course of her life. Her mother and I would support whatever path she chose. On a cool evening in May, my wife and I were watching TV when Emily dashed down the stairs yelling something about someone needing help. She ran past us and out the front door disappearing into the night. My heart pounding in my chest, I clumsily put on shoes and followed behind her, sprinting down the pitch-black road. I had no idea what we were running toward. When I arrived on scene, I saw a woman kneeling on a driveway with her husband’s badly injured body resting on her lap. There was a strong smell of gasoline coming from a mangled motorcycle in the grass a few yards away. The woman was pleading to God, “Jesus, please. I can’t live without him. Robert, can you hear me? He’s not breathing! He’s not breathing!” Even in the darkness, it was easy to piece together what happened. Robert skidded off the road and slammed into a concrete culvert and a brick mailbox. His wife, riding with him on a separate bike, probably saw it happen. As we waited what seemed like an eternity for help to arrive, I saw my daughter sitting quietly with the woman, rubbing her back, making sure she knew she was not alone. Sirens could be heard faintly in the distance as we prayed with the stranger losing her husband right in front of us. It came as no shock to us some months later when Emily announced she would be joining the Navy. She runs toward danger. Separation from our daughter has been hard on our family. Emily has a twin sister and I know it’s been extremely difficult for her. Before boot camp, the two girls never spent more than a week apart from their “womb-mate” in eighteen years. Last week, we received word that our sailor will be deployed overseas for the next seven months. Suddenly, military life got real. For a parent, it’s an odd combination of loss, pride, and excitement for her and what she’s about to experience. It seems – in our minds – she was a silly little eight-year-old with pig tails like two weeks ago – now she’s serving and defending a nation. The whiplash of that is hard to describe, but we take each day as it comes knowing it’s one day closer to seeing her again. Lord, please hear our prayer. Protect her from harm or defeat. and return her safely home.